Would you believe it, in the last couple of weeks we had a Tornado ( not up to American standards) which was devastating for those affected on Hayling Island, a little further along the coast. Early on Monday morning we had a brief storm which was forecast. I say brief as the major winds only lasted a few hours. But again devastating for those affected. We were warned a couple of days in advance that we needed to make sure everything was battened down, so we duly went round checking everything. People moved cars out of range of tall trees. Tables, chairs and flower pots were stowed. In the short time allowed only a few people got their boats out of the water, but most had to rely on their moorings and that they would hold. The Eucalyptus from our house. A couple of gardens away someone has an absolutely massive Eucalyptus. Each time there is a storm I worry for the houses in the next road and downwind of the tree. On Sunday night I was no less worried as the tree was getting a hammering and the massive boughs were waving in the wind. I wondered, before I went to bed, how the tree would weather this storm forecast to be major. I also prayed that the people in the houses nearest the tree would be safe. The storm started seriously during the night and when we got up at 06:00 when still dark, we could see in the gloom that the skyline had changed. The tree was down! But where and how were the houses on the other side? Was anyone hurt? 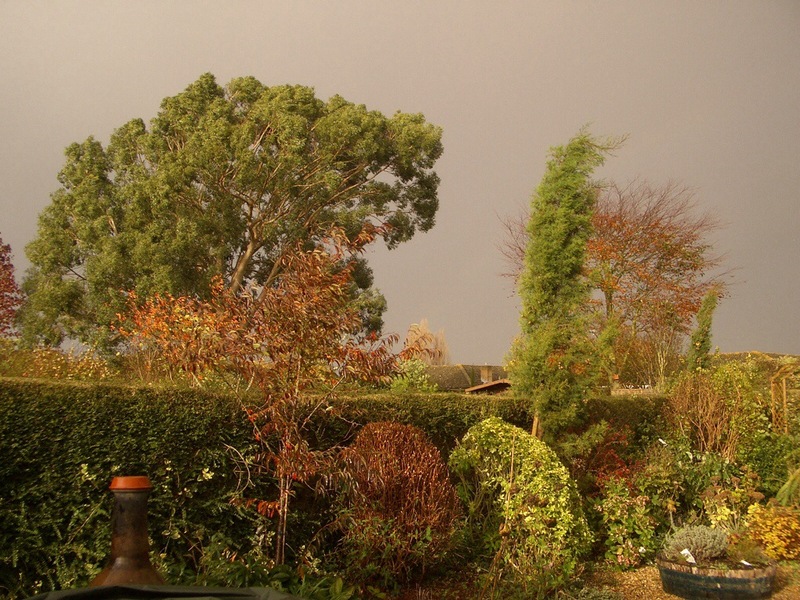 As it got lighter we could see that the tree had fallen along the boundary and luckily only taken with it the surrounding fences and our next door neighbours garden lounge – now squashed flat! Thank goodness! Although our immediate neighbour now had a massive tree lying across the bottom of their garden and a lot of physical damage from that, they too were relieved that it was this rather than the people in the houses in range of the tree that was affected! 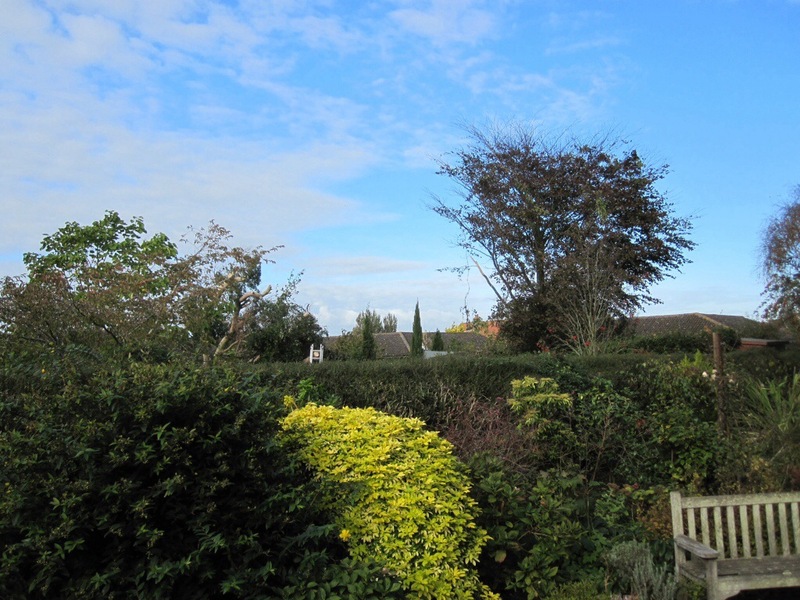 The horizon in Early November 2009 and today. Now I suppose it is an issue for the tree owners to sort out, but it does bring home the fact that if you have something planted in your garden that isn’t native to the area, it does have to be looked after appropriately. Even our native species can grow too large for our private gardens so we do have responsibilities. By the way we now have a lot of light in the garden. And, of the boats in our creek we could only see two that had come loose from their moorings and had beached. We were lucky. Not everyone was. The remains of the tree on its side today. Phil Weng, the tree surgeon, is removing it. My husband was amused by me taking the last picture in my dressing gown! < Do you use photographs in botanical art?!!!! Well done, it’s very good and I really admire the way you’re keeping the momentum with your blogs. Keep it up, it’s great. Thank you very much Rick. It always helps to get positive feedback.